On Tuesday night, city staffers and Bedford Institute of Oceanography scientist gave a presentation to city council on climate change and sea level rise. View slideshow! 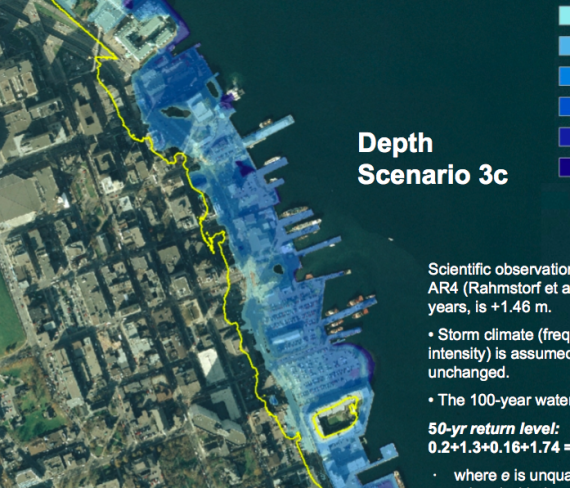 Tuesday night, Halifax city staffers Roger Wells and John Charles and Bedford Institute of Oceanography scientist Don Forbes teamed to give a presentation to city council on climate change and sea level rise, and what we should do to prepare for it. I'd seen most of the material before, but the presentation was well-done, and I'd encourage everyone to have a look at the PowerPoint slides that were presented. I've placed the entire presentation here. The slides of the various projections are very cool-- see pages 20 through 37. The bottom line is this: over the next 100 years, we can expect a sea level rise of 57 cm, but as Nova Scotia is sinking at a rate of 1.6 mm a year (16 cm over a century), the total apparent rate of sea level rise is 73 cm. Add to that storm surges, and that's what we need to prepare for. There's a very important caveat to this: the 57 cm figure is based on the "worst case" IPCC projections, but as page 11 shows, that "worst case" projection is already being exceeded, because the IPCC assumed that the Greenland and Antarctic ice shelves would remain stable---they haven't, and the ice melt from them is increasing sea levels beyond expectations.